A new regulation under the Wildlife Act has been put in place that protects valuable Mule Deer winter range around Summerland. 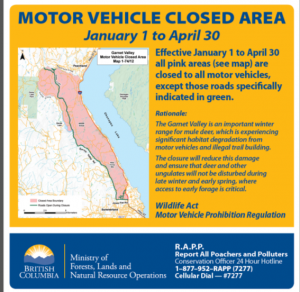 Between January 1st and April 30th, when mule deer are most vulnerable and in need of this habitat, all motor vehicles including ATVs, motorcycles and snowmobiles will be restricted to a single north – south designated route. Signs displaying this designated route are now in place. A second phase is scheduled to be implemented in January 2014 will include legislation that defines additional designated trails for use during the period from May 1 to December 31 each year. This includes defined trails that will be clearly identified and signage provided. This will allow increased access on some trails that are not allowed in the winter period but still afford the needed habitat protection by reducing the number of illegal trails currently scattered over this area. Disturbed areas will be given a chance to rehabilitate. Conservation Officers will be enforcing the regulations with an emphasis on education and awareness in the first year of implementation. In the initial stages, violators may be issued a warning or a violation ticket for a $230.00 penalty for travel off the designated routes. There is a $575.00 specified penalty ticket if habitat destruction is observed.